Mubychem Group, established in 1976, is the pioneer manufacturer of Caustic Potash Potassium Hydroxide Pellets, Pharmaceutical, Fragrance & Flavor chemicals in India. Mubychem Group has several manufacturing facilities spread across Gujarat and Mumbai India and world wide contacts and toll manufacturers. We are exporting globally to countries like USA, Europe, UAE, South Africa, Tanzania, Kenya, Egypt, Nigeria, Uganda, Turkey, Mexico, Brazil, Chile, Argentina, Dubai, Indonesia etc. Potassium hydroxide contains not less than 85.0 per cent and not more than the equivalent of 100.5 per cent of total alkali, calculated as KOH. 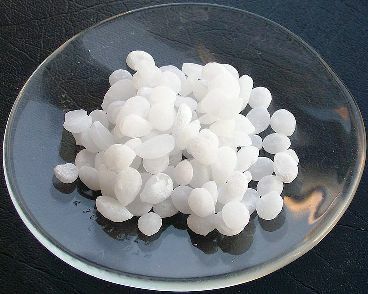 White, crystalline, hard masses, supplied as sticks, pellets or irregularly shaped pieces, deliquescent in air, hygroscopic, absorbing carbon dioxide, very soluble in water, freely soluble in alcohol. A. Dissolve 0.1 g in 10 ml of water (this solution is used for identification test B). Dilute 1 ml of the solution to 100 ml with water. The pH of this solution is not less than 10.5. B. 1 ml of the initial solution prepared in identification test A gives reaction of potassium. Dissolve 2.5 g in 10 ml of water. Carefully add 2 ml of nitric acid, with cooling, and dilute to 25 ml with dilute nitric acid. Dissolve 10 g in 15 ml of distilled water. Carefully add 12 ml of hydrochloric acid, with cooling, and dilute to 50 ml with dilute hydrochloric acid. Dissolve 5 g in carbon dioxide-free water and dilute to 50 ml with the same solvent. The solution is clear and colourless. Not more than 2.0 per cent, calculated as K2CO3. Dilute 10 ml of solution S1 to 15 ml with water. The solution complies with the limit test for chlorides (50 ppm). Dilute 5 ml of solution S1 to 100 ml with water. The solution complies with the limit test for phosphates (20 ppm). 15 ml of solution S2 complies with the limit test for sulphates (50 ppm). If intended for use in the manufacture of hem dialysis solutions, it complies with the test for aluminium. Dissolve 20 g in 100 ml of water and add 10 ml of acetate buffer solution pH 6.0. The solution complies with the limit test for aluminium (0.2 ppm). Use as the reference solution a mixture of 2 ml of aluminium standard solution (2 ppm Al), 10 ml of acetate buffer solution pH 6.0 and 98 ml of water. To prepare the blank use a mixture of 10 ml of acetate buffer solution pH 6.0 R and 100 ml of water. Dilute 5 ml of solution S2 to 10 ml with water R. The solution complies with the limit test for iron (10 ppm). Not more than 1.0 per cent of Na, determined by atomic absorption spectrometry. Dilute 10 ml of solution S2 to 20 ml with water. 12 ml of the solution complies with limit test A for heavy metals (10 ppm). Prepare the standard using lead standard solution (1 ppm Pb). Potassium Hydroxide contains not less than 85.0 percent of total alkali, calculated as KOH, including not more than 3.5 percent of K2CO3. Identification— A solution (1 in 25) responds to the tests for Potassium. Insoluble substances— Dissolve 1 g in 20 mL of water: the solution is complete, clear, and colorless. Heavy metals— Dissolve 0.67 g in a mixture of 5 mL of water and 7 mL of 3 N hydrochloric acid. Heat to boiling, cool, and dilute with water to 25 mL: the limit is 0.003%. Potassium Hydroxide occurs as white or nearly white pellets, flakes, sticks, fused masses, or other forms. Upon exposure to air, it readily absorbs carbon dioxide and moisture, and it deliquesces. One gram dissolves in 1 mL of water, in about 3 mL of alcohol, and in about 2.5 mL of glycerin. It is very soluble in boiling alcohol. Identification: A 1:25 aqueous solution gives positive tests for Potassium. Assay: Not less than 85.0% and not more than 100.5% of total alkali, calculated as KOH. Carbonate (as K2CO3): Not more than 3.5%. Mercury: Not more than 0.1 mg/kg. NOTE. Reagent potassium hydroxide usually contains 10-15% water.